RISC5 is the premier software package for performing fate and transport modeling as well as human health and ecological risk assessments for contaminated sites. RISC5’s distinguishing feature is its ability to perform backward risk calculations in addition to conventional forward risk calculations. Backward risk calculation in RISC5 computes a cleanup level for an input risk value. RISC5 also offers fate and transport models to estimate receptor point concentrations in both air and groundwater. RISC5 is the only RISC package to offer these features while using up to nine exposure pathways to estimate the potential for adverse human health impacts. Additional pathways and other non-human health impacts may be considered in future revisions of RISC. RISC has an intuitive graphical interface; it was developed with teaching principles of risk assessment and fate and transport as a primary goal. 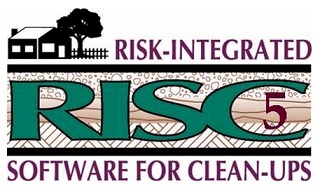 RISC allows for pathway, compound and receptor additivity both when calculating risk and in calculating clean-up levels. All of the fate and transport models that start with a soil source can be used in the presence of phase-separated product (Raoult’s Law is considered for all soil source models). There is a transient vadose zone leaching model in RISC than can also be used to predict volatile emissions. The soil source models consider mass balance (that is, they can model depleting sources). The groundwater models are transient (i.e. they can handle time varying input). RISC includes several exposure pathways not considered in other risk assessment software (to date) such as dermal exposure and inhalation during indoor showering, irrigation pathways and surface water and sediment intake pathways (both for humans and ecological receptors). RISC has a large internationally derived surface water criteria and sediment criteria database for comparing modeled results with these environmental criteria. Print or save tables, charts, and figures. Calculate clean-up levels in soil and groundwater using MCLs (maximum concentration levels) or user-supplied concentrations in groundwater or surface water as targets (as opposed to risk-based calculations). Default receptor profiles may be added, or modified, by the user. RISC5 has been designed to run on an individual computer, that is, it can not be run over a network. The back-calculation has a bug in it when using inhalation pathways. This bug occurred several versions ago when we updated the code to follow the “new USEPA” approach to using inhalation reference concentrations (RfCs) and inhalation unit risk factors (URFs). The previous approach used toxicity parameters similar to the other pathways (dermal toxicity and oral toxicity). So, the “work-around” for this bug, is to iterated on the concentration term when you need to perform a back-calculation for inhalation pathways. You change the source concentrations, calculate risk in the “forward” mode and check the risk and hazard index. Based on the results of this, you can increase or decrease your source concentration terms until you reach your risk target. This should go very fast because the calculations are performed quickly. This bug has been fixed in the code, however a new version has not been released because there is also a bug in the saturated soil model that is being worked on. When the saturated soil model is fixed, a new version will be released and you all will be notified and provided a new link to the updated version. If using the saturated soil model, you should always set the time step to 1 year. This bug is currently being fixed in the code and will be released in the next version. Also, if any of your projects include a number of chemicals for which the total risk needs to reach some target (cumulative risk across all chemicals), I highly encourage you to do the “back-calculation” this way so you can control the range of source concentrations. This is a very important point. The reason is, if, for example, you have a high benzene concentration and a low benzo(a)pyrene (BaP) concentration and you are calculating risk from an indoor air model (or a leaching model), the BaP should not provide any significant risk since it is non-volatile and highly sorbs to soil. However, if you use the “Cumulative” risk option in Step 5, the RISC5 code assumes that all of the source concentrations will be reduced or increased using the same initial ratio of concentrations. So, if the benzene source concentration needs to be reduced 100-fold to meet the risk target, when using the “Cumulative” option, the BaP concentration will be reduced 100-fold as well. This is not good practice because the BaP was not contributing to risk in the first place so its source concentration does not need to be reduced in this case. Because of the equations used in the saturated soil model when compared to “real-life”, the model should be used with a lot of caution, because it can over-estimate the flux of dissolved phase chemicals at the downgradient edge of the source. This caution is also true for all of the vapor models that use soil source concentrations. One reason this happens is that the equilibrium partitioning equation is used to determine the both the dissolved phase concentration and the vapor phase concentration in the source usually over-estimates concentrations in those media (water and air) because the chemical sorbs more strongly to soil in “real life” than is predicted by the equilibrium partitioning equations in our fate and transport models (even with Raoult’s Law applied). It turns out (based on many technical articles based on measured data) that the equilibrium partitioning equation (which just uses the fraction organic carbon (Foc) to calculate sorption) tends to over-estimate the dissolved and vapor phases of the chemical concentrations when compared to measured data from the field. There are probably many reasons for this, one is that Foc is not the only cause for a chemical to sorb to soil (i.e. there are other causes of sorption and retardation). For example, the equilibrium partitioning equation assumes that all of the chemical sorbed to soil is “available” to be put in the dissolved phase or vapor phase. However, the reality may be, that only a fraction of the chemical is adjacent to the pore water and air content and only that top layer can desorb at one time. In other words, it may not be a good idea to assume “equilibrium partitioning” exists all the time. However, currently this is the most commonly used predictor of sorption and desorption in any risk assessment models, so that’s what we have. It is just something to be aware of and it indicates why it is so important for the air models to get soil vapor concentrations rather than soil concentrations if possible. The updated software will be sent out as soon as it is available.